number. It works on Android and iOS both. This app will be launched this summer. Main problem with any video calling app is that it doesn't work well on slow internet connection. 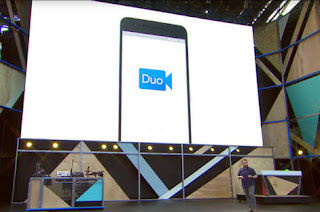 Google's Duo has come with a new protocol QUIC that will work even on slowest internet connection. Duo is end to end encrypted. So, it will provide secure communication. Favourite feature of Duo is knock-knock. It will show a live video preview of the caller before picking up the phone. After picking the call, Duo will give seamless transitions into the call. Duo call supports HD video (up to 720p) and audio. For limited bandwidth, it adjusts its quality, so that you will remain connected. It provides also a seamless transition calls between cellular and wifi. So, Duo is able to run on any network. As it is end-to-end encrypted, it is secure enough.